To get to CABERNET COTTAGE, turn off the Tanunda main street, at the two story Museum, into Mill Street. Follow the street sign. CABERNET COTTAGE is on the left at Number 6. Access to the property is via a keybox and this is given to you upon check in. CABERNET COTTAGE is a Cosy, self-contained cottage with 3 bedrooms and 2 bathrooms suitable for groups up to 8. Cabernet Cottage is a cosy, three bedroom self-contained cottage that can sleep up to eight adults. There are two bathrooms, both with spa baths and two bedrooms each with a queen size bed. The third bedroom has two king single beds (can convert to king bed upon request) and there is a queen size sofa bed in the lounge room. The cottage has an open wood fire. CABERNET COTTAGE is Cosy self-contained cottage with 2 bathrooms both with spa-baths, 3 bedrooms, 2 with a queen-size beds and 1 with either 2 singles or a King and a QS sofa bed, open fire, air-conditioning and Cottage garden. Located 100 meters from Tanundas main street, CABERNET COTTAGE is close to restaurants, shops and the Barossa Valleys famous wineries. Cot is available upon request - Pets are welcome with a $25 surcharge. Check in is 2pm and check out is 10.30am. NO EARLY CHECK INS ALLOWED FOR THIS PROPERTY. Cabernet Cottage located Tanunda, Barossa Valley in South Australia. Spa, wood fire, 2 bathrooms, walk to wineries and restaurants. Experience South Australia’s world renowned wine region with a unique Barossa Valley getaway. Use our quick accommodation search and find affordable places to stay. The Barossa is famous for its wine, produce and gorgeous scenery. So make the most of our award winning tourism services and find your ideal escape today. If you need information on local businesses, what’s on, car hire, or last minute deals please follow our easy guide to cheap holidays in the Barossa Valley. We have advice on must sees wineries as well as tours and activities. 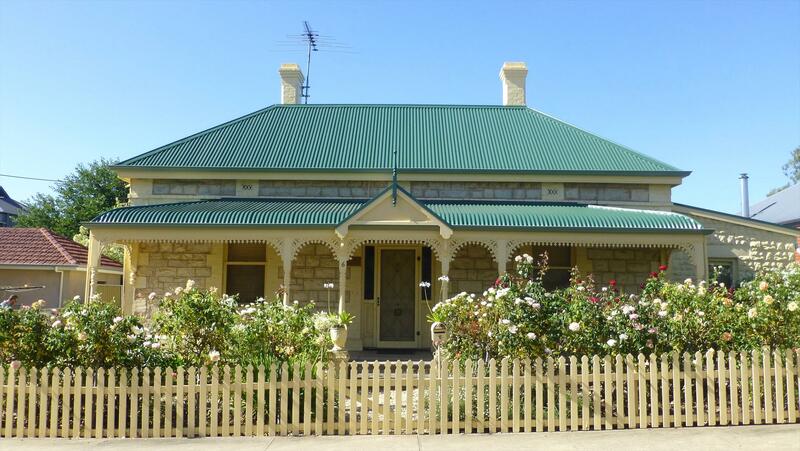 Also stay in one of the many heritage bed and breakfast’s the Barossa Valley has to offer. Our accommodation search has all available listings in the region. All service changes/cancellations will be subject to a minimum $50 AUD cancellation / administration fee. Cancellation notified 30 days or more prior to arrival date will be entitled to a refund of the deposit / money paid less minimum $50 AUD. Full payment is due for bookings within 30 days of arrival date; failure to arrange payment will result in cancellation of the booking. Cancellations notified 30 days or less prior to arrival date and where the guest has entered an agreement to make final payment on the day of arrival the guest remains liable for the full payment. Payment will be invoiced to the guest and / or charged to any security held by this service. Cancellations notified 30 days or less prior to arrival date will forfeit the full deposit / money paid. When a booking has been made 30 days or less prior to arrival date and cancelled the full deposit / money paid will be forfeited. DAMAGES / SMOKING / CLEANING POLICY All bookings are subject to an accidental / willful damage policy a no smoking policy and an excess cleaning policy. Where the individual services confront interruption to business or unreasonable delay and expense in business operations the responsible guest will be charged accordingly. Travel insurance is recommended for all bookings to provide adequate protection against cancellation of travel.